One of the common problems while using voice recorders is insufficient memory for a longer recording period. Generally most of the voice recorders can do recording up to a few hours only. To extend the recording time, Sony has introduced the ICD-UX80 digital recorder which can hold up to 580 hours of recording time of low quality voice or 36 hours of high-quality stereo MP3 audio. Sony ICD-UX80 will be useful for recording long conversations. This small, compact and handy device comes with 2GB built-in flash memory. It has a USB direct key which can plug in directly to PC to upload the recorded voice. It is compatible with Windows and Macintosh computers. ICD-UX80 features built-in stereo microphones for realistic recording. Users also can use ICD-UX80 to play back their favorite MP3 audio files via the in-built speaker or stereo headphones. This attractive digital recorder has five recording modes, digital pitch control and playback features. It uses one AAA battery to operate and a brand new battery can last up to 34 hours recording time. The tiny device weighs 1.7 ounces and it has a dot-matrix LCD display screen with backlight. 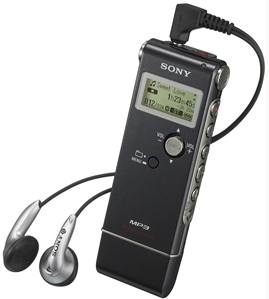 Reporters or students who need long recording hours will find the Sony ICD-UX80 helpful and practical.